The Hewatt Violin Studio is conveniently located minutes from the heart of downtown Redding. A recently relocated violinist from the Bay Area, Katheryn has over twenty years of experience performing and teaching violin and viola both across the United States and abroad. She is a certified Suzuki educator as well as an accomplished traditional teacher, combining the strengths of Suzuki, Roland, Zweig, and Galamian. 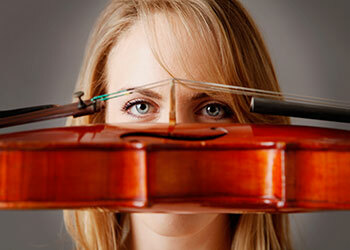 Her award-winning students receive private violin lessons as well as ensemble opportunity. Technique, musical expression, theory, solfege, music history, musicianship, improvisation, and other supplementary subjects are incorporated into private lessons for a complete education. Performance opportunity is regularly offered and encouraged. Katheryn passionately believes anyone can learn the violin and share in this beautiful form of expression. Playing the violin is fun and rewarding! Schedule an audition by either filling out the form on this page or calling Katheryn directly. Tuition and lesson lengths will be determined during your first consultation. Katheryn Hewatt began her studies at the age of two under the instruction of her older brother, making her debut with orchestra at the age of 9. Beginning her studies in Texas, Ms. Hewatt moved to Seattle, WA, studying with Margaret Pressley at the Seattle Conservatory of Music. Heavily involved in the musical culture of the Northwest, she soloed with various orchestras, was featured in monthly recitals, and surrounded herself in chamber groups and collaborative experience. Ms. Hewatt was awarded the Starling Scholar Award in 2002, which through The Juilliard PreCollege program, provided a full scholarship toward her studies with Margaret Pressley and The Seattle Conservatory of Music. She has since then performed internationally and studied with numerous teachers in demand worldwide including Dean Emeritus of The Juilliard School, Stephen Clapp, concertmaster of The Philadelphia Orchestra, David Kim, and violin and viola professor of New England Conservatory of Music, Paul Biss. She holds a degree with honors in violin performance and was awarded a concentration in Music-in-Education for her research in violin pedagogy. Ms. Hewatt is an experienced performer and teacher, has actively served on education boards including Music Teachers National Association, American String Teachers Association, and Suzuki Association of Northern California. Ms. Hewatt regularly serves as an adjudicator for various competitions and programs. She has built a thriving studio, appeared as a guest speaker at San Francisco Conservatory of Music, worked professionally as a faculty member of Grace College’s community outreach program, as a solo performer, and collaborative musician. Recommended lesson length and tuition will be determined during your first consultation with Katheryn.